Once again it is time for another Children's Classics carnival over at 5 Minutes for Books. I scrolled through the list of Caldecott winners of days gone by and while several looked familiar to me, and I thought of reviewing one or two, it's been so long since I've read them that I decided against it. However, I thought I would take this opportunity to learn about the Caldecott Awards themselves. Instead of maintaining this attitude towards children's book awards I decided to find out just what the Caldecott award is and why it matters. 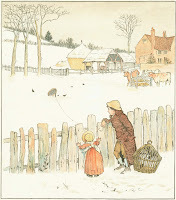 Caldecott's work is classic and timeless. Every piece that I have looked at reminds me of England, which makes this American award rather ironic in some ways. In order to receive this award, you must be a resident or citizen of the United States. 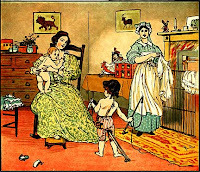 While the United States might not have birthed Caldecott, it saw the value of his work. In fact, in seeking a warmer climate and better conditions for his health needs, Caldecott died while traveling in Florida. It is a fitting tribute for my home country to pay in honoring this English born illustrator. The importance of any illustration's effect on the imagination should not be underestimated. A person's painting or drawing is frequently integral to how we view an entire work in our head. The artwork on the cover of a book can effect whether or not we pick it up in the first place. It's not just about marketing (although there is that to consider) but imagination. What appeals to the better part of our brains to transport us to magical worlds? What helps to broaden our perspective? What illustrations can cause us to hate a movie for not portraying characters the way that have always viewed them in our minds, or perhaps causes us to love it? Illustrations are important. A drawing or painting or photograph holds a great deal of power and should be used in the right way. An illustration that compliments a word should be viewed with a little bit of reverence. Jesus painted pictures in our heads by sharing parables that would humanize and communicate God's truth. Likewise, artwork also communicates truth by painting pictures in our heads. Images speak volumes and good images should be approved and applauded. Hence, I am firmly behind the idea of the Caldecott Award and am very glad to know more about it so that I can adequately (or not so adequately) appreciate its worth. It is a beautiful thing and I look forward to exploring various books that I have received the distinction of having received it. If you would like to view more information on Randolph Caldecott or this award, I would encourage you to visit the following websites. Per usual, some are better than others. There is a ton of information out there and, quite honestly, Wikipedia's information on Caldecott the man is the most straightforward. You can also read up on the award on the American Library Association website. I hope you will take a little time to read up on it because I do think it's a worthwhile study to appreciation. It effected the way I viewed book awards. At any rate, I hope you are enjoying the Children's Classic carnival. If you participated, let me know. I'll be visiting around! Nice post. Thank you for the history lesson I didn't take. Nice post. I chose Madeline. I didn't go into history though I really should have. Great post! Very informative and I liked hearing your take on it. Great information about Caldecott! I really didn't know anything about him or the award before this. I chose to review the 2006 award winner. Really enjoyed your post! Knowing the history of the award makes it more meaningful.